1. Value – A good UX is one that solves a real problem for the user. If we deliver value, we are not wasting minutes of someone’s life. 2. Ease of use – A good UX is one that a user finds easy to navigate and to understand how to use. If we make something easy to use and to understand, we are supporting value (the first tenet of good UX). 3. Enjoyable – A good UX is a pleasure to use. It engages us and, optimally, it delights us. Typically, UX refers to the experience of using software. But it can actually go way beyond software to our experiences in the real world. This could include our experience with a utensil, attending an event, or onboarding with a new organization or role. It has huge relevance to effective learning design. The result, too often, is solutions that are out of balance. They may be viable from a business perspective and feasible from a technical perspective, but they completely miss the mark from the learner perspective. Or, they may be awesome from the learner point of view but technically unsustainable or unviable business-wise. So how do we get to an optimal learning experience? How do we bring the target learner back into the design process in a way that is actually feasible for a business? Try taking a step away from the L&D world and into the world of complex problem solving and product development. Consider embracing the philosophy, steps, and tools of a practice known as “design thinking.” Design thinking originated in 1969 and really came into its own in the 1990s as a human-centered approach to designing solutions. It has been used to resolve massive human problems as well as to design software solutions or consumer products. Design thinking evolves solutions through an iterative process of observation, insight, ideation, experimentation, and testing. 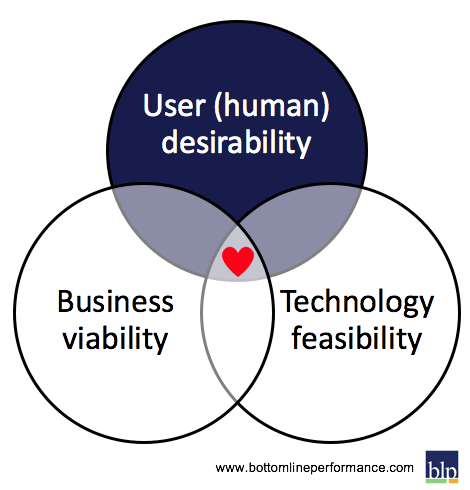 Its goal is to produce solutions that find the ”sweet spot” between human needs, business viability, and technical feasibility. The end user of the solution is the focal point. Any solution devised through the process must be designed with this user top-of-mind and involved in the formulation, design, and testing of the solution. 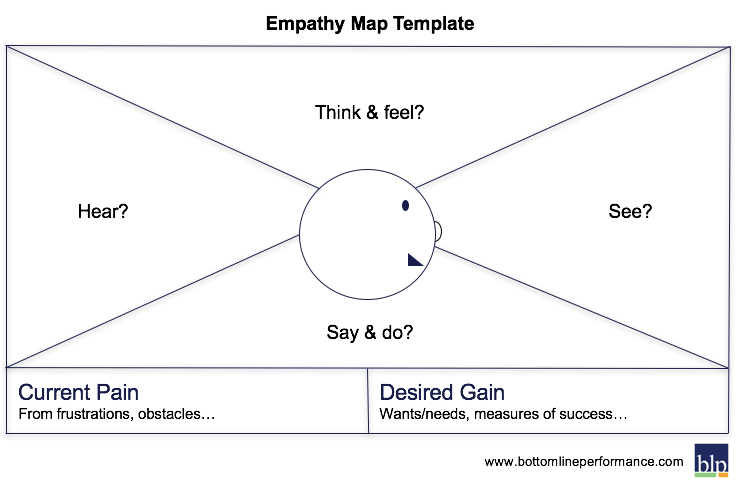 Empathy maps help people quickly form a picture of the target user and see where gaps in understanding might be. In a learning design project, these can be used to quickly help a design team form insights about learners or recognize gaps in understanding that need to be closed. There are tons of resources on empathy map developing – just google “empathy maps” to find examples and templates. 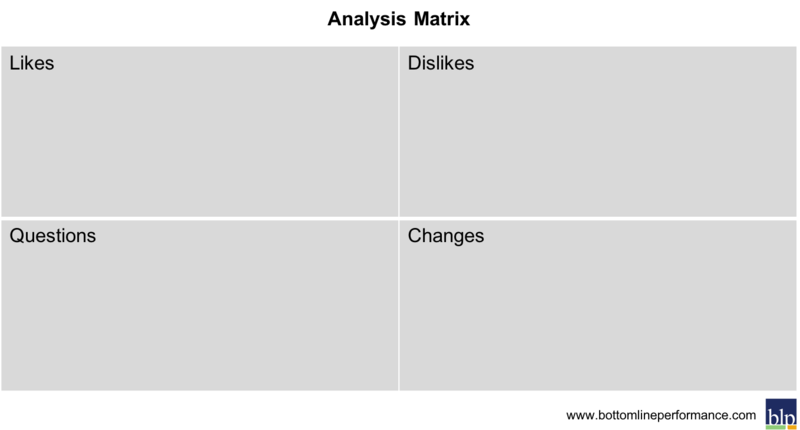 Four quadrants to plot during solution testing: what people liked, what they didn’t like, what they had questions about, and what they would change. Journey maps show what a learning experience is actually like for a learner, what the pain points are, and what opportunities could be leveraged. This presentation by Joyce Seitzinger on crafting a meaningful learning experience shows the evolution of a journey map. She uses design thinking to craft the entire experience. 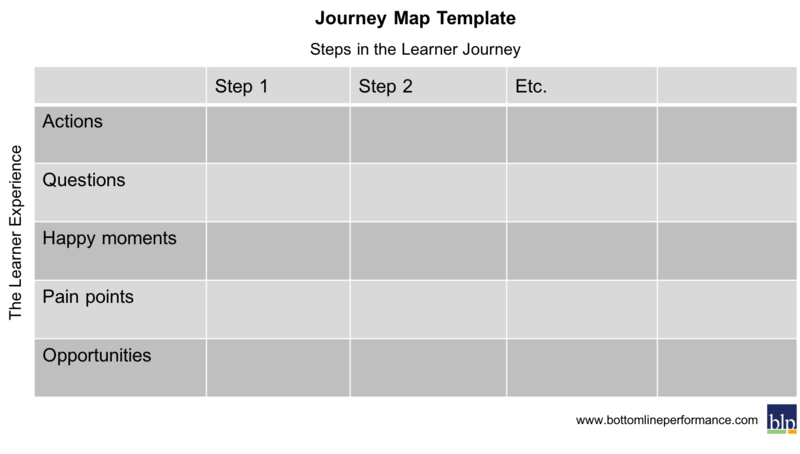 Here’s a simple starter template if you want to try creating one yourself. The categories to plot are on the left column. The steps involved go across the top. 1. Deliver value to the learner and the organization. 3. Are enjoyable and engaging. Our worksheet lets you check to see what questions you are currently asking about learners, see a sample learner persona and create a persona of your own. Attend our eXLearn 2019 pre-conference workshop on using design thinking to create a better learner experience.